This article is about the Ares I launch vehicle. For other uses, see Ares (disambiguation). NASA planned to use Ares I to launch Orion, the spacecraft intended for NASA human spaceflight missions after the Space Shuttle was retired in 2011. Ares I was to complement the larger, unmanned Ares V, which was the cargo launch vehicle for Constellation. NASA selected the Ares designs for their anticipated overall safety, reliability and cost-effectiveness. However, the Constellation program, including Ares I was cancelled by U.S. president Barack Obama in October 2010 with the passage of his 2010 NASA authorization bill. In September 2011, NASA detailed the Space Launch System as its new vehicle for human exploration beyond Earth's orbit. In 1995 Lockheed Martin produced an Advanced Transportation System Studies (ATSS) report for the Marshall Space Flight Center. A section of the ATSS report describes several possible vehicles much like the Ares I design, with liquid rocket second stages stacked above segmented solid rocket booster (SRB) first stages. The variants that were considered included both the J-2S engines and Space Shuttle Main Engines (SSMEs) for the second stage. The variants also assumed use of the Advanced Solid Rocket Motor (ASRM) as a first stage, but the ASRM was cancelled in 1993 due to significant cost overruns. determine the "top-level requirements and configurations for crew and cargo launch systems to support the lunar and Mars exploration programs"
assess the "CEV requirements and plans to enable the CEV to provide crew transport to the ISS"
"develop a reference lunar exploration architecture concept to support sustained human and robotic lunar exploration operations"
"identify key technologies required to enable and significantly enhance these reference exploration systems"
A Shuttle-derived launch architecture was selected by NASA for the Ares I. Originally, the crewed vehicle would have used a four-segment solid rocket booster (SRB) for the first stage, and a simplified Space Shuttle Main Engine (SSME) for the second stage. An unmanned version was to use a five-segment booster with the same second stage. Shortly after the initial design was approved, additional tests revealed that the Orion spacecraft would be too heavy for the four-segment booster to lift, and in January 2006 NASA announced they would slightly reduce the size of the Orion spacecraft, add a fifth segment to the solid-rocket first stage, and replace the single SSME with the Apollo-derived J-2X motor. While the change from a four-segment first stage to a five-segment version would allow NASA to construct virtually identical motors, the main reason for the change to the five-segment booster was the move to the J-2X. The Exploration Systems Architecture Study concluded that the cost and safety of the Ares was superior to that of either of the Evolved Expendable Launch Vehicle (EELVs). The cost estimates in the study were based on the assumption that new launch pads would be needed for human-rated EELVs. The facilities for the current EELVs (LC-37 for Delta IV, LC-41 for Atlas V) are in place and could be modified, but this may not have been the most cost effective solution as LC-37 is a contractor owned and operated (COGO) facility and modifications for the Delta IV H were determined to be similar to those required for Ares I. The ESAS launch safety estimates for the Ares were based on the Space Shuttle, despite the differences, and included only launches after the post-Challenger Space Shuttle redesign. The estimate counted each Shuttle launch as two safe launches of the Ares booster. The safety of the Atlas V and Delta IV was estimated from the failure rates of all Delta II, Atlas-Centaur, and Titan launches since 1992, although they are not similar designs. Ares I was the crew launch component of the Constellation program. Originally named the "Crew Launch Vehicle" or CLV, the Ares name was chosen from the Greek deity Ares. Unlike the Space Shuttle, where both crew and cargo were launched simultaneously on the same rocket, the plans for Project Constellation outlined having two separate launch vehicles, the Ares I and the Ares V, for crew and cargo, respectively. Having two separate launch vehicles allows for more specialized designs for the crew and heavy cargo launch rockets. The Ares I rocket was specifically being designed to launch the Orion Multi-Purpose Crew Vehicle. Orion was intended as a crew capsule, similar in design to the Apollo program capsule, to transport astronauts to the International Space Station, the Moon, and eventually Mars. Ares I might have also delivered some (limited) resources to orbit, including supplies for the International Space Station or subsequent delivery to the planned lunar base. NASA selected Alliant Techsystems, the builder of the Space Shuttle Solid Rocket Boosters, as the prime contractor for the Ares I first stage. NASA announced that Rocketdyne would be the main subcontractor for the J-2X rocket engine on July 16, 2007. NASA selected Boeing to provide and install the avionics for the Ares I rocket on December 12, 2007. On August 28, 2007 NASA awarded the Ares I Upper Stage manufacturing contract to Boeing. Boeing built the S-IC stage of the Saturn V rocket at Michoud Aerospace Factory in the 1960s. The upper stage of Ares I was to have been built at the same rocket factory used for the Space Shuttle's External Tank and the Saturn V's S-IC first stage. A concept image of an Ares I launching from Kennedy Space Center launchpad 39B. On January 4, 2007, NASA announced that the Ares I had completed its system requirements review, the first such review completed for any manned spacecraft design since the Space Shuttle. This review was the first major milestone in the design process, and was intended to ensure that the Ares I launch system met all the requirements necessary for the Constellation Program. In addition to the release of the review, NASA also announced that a redesign in the tank hardware was made. Instead of separate LH2 and LO2 tanks, separated by an "intertank" like that of the Space Shuttle External Tank, the new LH2 and LOX tanks would have been separated by a common bulkhead like that employed on the Saturn V S-II and S-IVB stages. This would have provided a significant mass saving and eliminated the need to design a second stage interstage unit that would have had to carry the weight of the Orion spacecraft with it. In January 2008, NASA Watch revealed that the first stage solid rocket of the Ares I could have created high vibrations during the first few minutes of ascent. The vibrations would have been caused by thrust oscillations inside the first stage. NASA officials had identified the potential problem at the Ares I system design review in late October 2007, stating in a press release that it wanted to solve it by March 2008. NASA admitted that this problem was very severe, rating it four out of five on a risk scale, but the agency was very confident in solving it. The mitigation approach developed by the Ares engineering team included active and passive vibration damping, adding an active tuned-mass absorber and a passive "compliance structure" – essentially a spring-loaded ring that would have detuned the Ares I stack. NASA also pointed out that, since this would have been a new launch system, like the Apollo or Space Shuttle systems, it was normal for such problems to arise during the development stage. According to NASA, analysis of the data and telemetry from the Ares I-X flight showed that vibrations from thrust oscillation were within the normal range for a Space Shuttle flight. A study released in July 2009 by the 45th Space Wing of the US Air Force concluded that an abort 30–60 seconds after launch would have a ~100% chance of killing all crew, due to the capsule being engulfed until ground impact by a cloud of 4,000 °F (2,200 °C) solid propellant fragments, which would melt the capsule's nylon parachute material. NASA's study showed the crew capsule would have flown beyond the more severe danger. The Ares I igniter was an advanced version of the flight-proven igniter used on the Space Shuttle's solid rocket boosters. It was approximately 18 inches (46 cm) in diameter and 36 inches (91 cm) long, and took advantage of upgraded insulation materials that had improved thermal properties to protect the igniter's case from the burning solid propellant. NASA successfully completed test firing of the igniter for the Ares I engines on March 10, 2009 at ATK Launch Systems test facilities near Promontory, Utah. The igniter test generated a flame 200 feet (60 meters) in length, and preliminary data showed the igniter performed as planned. Development of the Ares I propulsion elements continued to make strong progress. On September 10, 2009, the first Ares I development motor (DM-1) was successfully tested in a full-scale, full-duration test firing. This test was followed by two more development motor tests, DM-2 on August 31, 2010 and DM-3 on September 8, 2011. For DM-2 the motor was cooled to a core temperature of 40 degrees Fahrenheit (4 degrees Celsius), and for DM-3 it was heated to above 90 degrees Fahrenheit (32 degrees Celsius). In addition to other objectives, these two tests validated Ares motor performance at extreme temperatures. NASA conducted a successful 500-second test firing of the J-2X rocket engine at John C. Stennis Space Center in November 2011. 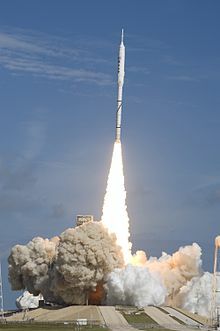 The Ares I prototype, Ares I-X, successfully completed a test launch on October 28, 2009. Launch Pad 39B was damaged more than with a Space Shuttle launch. During descent, one of the three parachutes of the Ares I-X’s first stage failed to open, and another opened only partially, causing the booster to splash down harder and suffer structural damage. The launch accomplished all primary test objectives. NASA completed the Ares I system requirements review in January 2007. Project design was to have continued through the end of 2009, with development and qualification testing running concurrently through 2012. As of July 2009[update], flight articles were to have begun production towards the end of 2009 for a first launch in June 2011. Since 2006 the first launch of a human was planned for no later than 2014, which is four years after the planned retirement of the Space Shuttle. Delays in the Ares I development schedule due to budgetary pressures and unforeseen engineering and technical difficulties would have increased the gap between the end of the Space Shuttle program and the first operational flight of Ares I. Because the Constellation program was never allocated the funding originally projected, the total estimated cost to develop the Ares I through 2015 rose from $28 billion in 2006 to more than $40 billion in 2009. The Ares I-X project cost was $445 million. Originally scheduled for first test flights in 2011, the independent analysis by the Augustine Commission found in late 2009 that due to technical and financial problems Ares I was not likely to have had its first crewed launch until 2017–2019 under the current budget, or late 2016 with an unconstrained budget. The Augustine Commission also stated that Ares I and Orion would have an estimated recurring cost of almost $1 billion per flight. However, later financial analysis in March 2010 showed that the Ares I would have cost $1 billion or more to operate per flight had the Ares I flown just once a year. If the Ares I system were flown multiple times a year the marginal costs could have fallen to as low as $138 million per launch. In December 2011, NASA administrator Charlie Bolden testified to congress that the Ares I would cost $4–4.5 billion a year, and $1.6 billion per flight. The Ares I marginal cost was predicted to have been a fraction of the Shuttle's marginal costs even had it flown multiple times per year. By comparison, the cost of launching three astronauts on a manned Russian Soyuz is $153 million. On February 8, 2011 it was reported that Alliant Techsystems and Astrium proposed to use Ares I's first stage with the second stage from the Ariane 5 to form a new rocket named Liberty. On February 1, 2010, President Barack Obama announced a proposal to cancel the Constellation program effective with the U.S. 2011 fiscal year budget, but later announced changes to the proposal in a major space policy speech at Kennedy Space Center on April 15, 2010. In October 2010, the NASA authorization bill for 2010 was signed into law which canceled Constellation. But previous legislation kept Constellation contracts in force until passage of a new funding bill for 2011. Comparison of the basic size and shape of the Saturn V, Space Shuttle, Ares I, and Ares V.
Ares I had a payload capability in the 25-metric-ton (28-short-ton; 25-long-ton) class and was comparable to vehicles such as the Delta IV and the Atlas V. The NASA study group that selected what would become the Ares I rated the vehicle as almost twice as safe as an Atlas or Delta IV-derived design. The rocket was to have made use of an aluminum-lithium alloy which is lower in density but similar in strength compared to other aluminum alloys. The alloy is produced by Alcoa. The first stage was to have been a more powerful and reusable solid fuel rocket derived from the Space Shuttle Solid Rocket Booster (SRB). Compared with the Solid Rocket Booster, which had four segments, the most notable difference was the addition of a fifth segment. This fifth segment would have enabled the Ares I to produce more thrust. Other changes made to the Solid Rocket Booster were to have been the removal of the Space Shuttle External Tank (ET) attachment points and the replacement of the Solid Rocket Booster nosecone with a new forward adapter that would have interfaced with the liquid-fueled second stage. The adapter was to have been equipped with solid-fueled separation motors to facilitate the disconnection of the stages during ascent. The grain design was also changed, and so were the insulation and liner. By the Ares I first stage ground test, the case, grain design, number of segments, insulation, liner, throat diameter, thermal protection systems and nozzle had all changed. The upper stage, derived from the Shuttle's External Tank (ET) and based on the S-IVB stage of the Saturn V, was to be propelled by a single J-2X rocket engine fueled by liquid hydrogen (LH2) and liquid oxygen (LOX). The J-2X was derived from the original J-2 engine used during the Apollo program, but with more thrust (~294,000 lbf) and fewer parts than the original engine. On July 16, 2007, NASA awarded Rocketdyne a sole-source contract for the J-2X engines to be used for ground and flight tests. Rocketdyne was the prime contractor for the original J-2 engines used in the Apollo program. Although its J-2X engine was derived from an established design, the upper stage itself would have been wholly new. Originally to have been based on both the internal and external structure of the ET, the original design called for separate fuel and oxidizer tanks, joined together by an "intertank" structure, and covered with the spray-on foam insulation to keep venting to a minimum. The only new hardware on the original ET-derived second stage would have been the thrust assembly for the J-2X engine, new fill/drain/vent disconnects for the fuel and oxidizer, and mounting interfaces for the solid-fueled first stage and the Orion spacecraft. Using a concept going back to the Apollo program, the "intertank" structure was dropped to decrease mass, and in its place, a common bulkhead, similar to that used on both the S-II and S-IVB stages of the Saturn V, would have been used between the tanks. The savings from these changes were used to increase propellant capacity, which was 297,900 pounds (135,100 kg). The spray-on foam insulation was the only part of the Shuttle's ET that would have been used on this new Saturn-derived upper stage. Ares IV, a proposed heavy-lift variant of Ares I and V combined. DIRECT, shuttle-derived launcher proposed as alternative to Ares I and Ares V.
^ Boen, Brooke (July 24, 2009). "NASA–Ares Launch Vehicles". NASA. Archived from the original on July 20, 2009. Retrieved August 5, 2009. ^ Ares: NASA's New Rockets (RealMedia). NASA TV. Retrieved August 15, 2009. ^ a b Dunbar, Brian; Wilson, Jim (November 23, 2007). "Building NASA's New Spacecraft: Constellation Work Assignments". NASA. Retrieved August 15, 2009. ^ a b c d e "NASA – Ares I Crew Launch Vehicle". NASA. April 29, 2009. Archived from the original on May 4, 2009. Retrieved May 13, 2009. ^ "Technical Area 2 Heavy Lift Launch Vehicle Development Final Report" (PDF). Lockheed Martin. NASA. July 1995. pp. 3–17, 3–18. Retrieved August 7, 2009. ^ a b c Mahoney, Erin (December 31, 2008). "Exploration Systems Architecture Study – Final Report". NASA. Archived from the original on August 31, 2009. Retrieved August 5, 2009. ^ "NASA Plans to Build Two New Shuttle-derived Launch Vehicles". Spaceref.com. July 5, 2005. Retrieved August 5, 2009. ^ Bergin, Chris (July 22, 2006). "NASA makes major design changes to CEV". NASAspaceflight.com. Archived from the original on April 5, 2008. Retrieved August 5, 2009. ^ Dunbar, Brian (May 9, 2008). "NASA Successfully Completes First Series of Ares Engine Tests". NASA. Retrieved August 5, 2009. ^ a b "The J–2X Engine" (PDF). Marshall Space Flight Center. November 18, 2008. Retrieved August 5, 2009. ^ Human-Rated Delta IV Heavy Study – Constellation Architecture Impacts (PDF), Aerospace Corporation, June 1, 2009, retrieved February 1, 2012 . ^ "Report to the President: Actions to Implement the Recommendations of the Presidential Commission on the Space Shuttle Challenger Accident" (PDF). NASA. July 14, 1986. ^ "To the moon and beyond: NASA's Exploration Systems Architecture Study". Wikileaks. March 6, 2009. Retrieved May 16, 2016. ^ Connolly, John F. (October 2006). "Constellation Program Overview" (PDF). Constellation Program Office. Retrieved July 6, 2009. ^ Bergin, Chris (December 7, 2005). "ATK win CLV contract". NASAspaceflight.com. Retrieved August 5, 2009. ^ a b "NASA's Ares I First Stage, Powering the Ares I Rocket for liftoff" (PDF). Marshall Space Flight Center. April 29, 2009. Retrieved August 5, 2009. ^ Wadsworth, Harry. "History – History of Michoud". Lockheed Martin. Archived from the original on August 4, 2009. Retrieved August 7, 2009. ^ "Boeing History – Saturn V Moon Rocket". Boeing. Archived from the original on July 19, 2009. Retrieved July 19, 2009. ^ "NASA Study Finds Human-rated Delta IV Cheaper". Aviation Week. June 15, 2009. Retrieved August 9, 2009. ^ "2005 ESAS Architecture Executive Summary" (PDF). NSS.org. January 2004. Archived from the original (PDF) on April 23, 2017. Retrieved April 23, 2017. ^ a b "NASA Completes Review Milestone for Ares I Vehicle" (Press release). NASA. January 4, 2007. Retrieved August 5, 2009. ^ Borenstein, Seth (January 18, 2008). "NASA's Next Rocket May Shake Too Much". Space.com. Associated Press. Retrieved August 5, 2009. ^ "USAF 45th Space Wing Study: Capsule~100%-Fratricide Environments (Implications for NASA's Ares-1 and Crew)". 45th Space Wing. July 16, 2009. Retrieved July 19, 2009. ^ a b Boen, Brooke (March 12, 2009). "NASA Ares Iginiter Tests". NASA. Retrieved August 5, 2009. ^ "NASA and ATK Successfully Test Ares First Stage Motor". http://www.nasa.gov/mission_pages/constellation/ares/dm1_success.html. Retrieved October 21, 2011. ^ "NASA and ATK Successfully Test Five-Segment Solid Rocket Motor". http://www.nasa.gov/mission_pages/constellation/ares/10-202.html. Retrieved October 21, 2011. ^ "NASA Successfully Tests Five-Segment Solid Rocket Motor". http://www.nasa.gov/exploration/features/dm3.html. Retrieved October 21, 2011. ^ NASA's New Upper Stage Engine Passes Major Test, NASA, November 9, 2011, retrieved February 1, 2012 . ^ "NASA Ares I-X (flight test prototype) page". NASA. Archived from the original on October 26, 2009. Retrieved October 27, 2009. ^ "Constellation Program: Ares I-X Flight Test Vehicle" (PDF). NASA. Archived (PDF) from the original on October 26, 2009. Retrieved October 27, 2009. ^ Karlgaard, Christopher D.; Beck, Roger E.; Derry, Stephen D.; Brandon, Jay M.; Starr, Brett R.; Tartabini, Paul V.; Olds, Aaron D. (n.d.). "Ares I-X Best Estimated Trajectory and Comparison with Pre-Flight Predictions" (PDF). American Institute of Aeronautics and Astronautics. NASA Langley Research Center. Retrieved September 15, 2011. ^ a b Bergin, Chris (October 31, 2009). "Pad 39B suffers substantial damage from Ares I-X launch – Parachute update". NasaSpaceFlight. Archived from the original on November 3, 2009. Retrieved November 2, 2009. ^ Stephan R. Davis (n.d.). "Operational Lessons Learned from the Ares I-X Flight Test" (PDF). American Institute of Aeronautics and Astronautics. Retrieved February 1, 2012. ^ Boen, Brooke (July 9, 2009). "NASA Ares I-X (flight test prototype) page". NASA. Retrieved August 9, 2009. ^ Connolly, John (October 2006). "Constellation Program Overview" (PDF). NASA. Retrieved August 9, 2009. ^ "First Stage Design Problems Arise For NASA's Ares 1 Rocket". Spaceref.com. November 16, 2007. ^ The Budgetary Implications of NASA’s Current Plans for Space Exploration, Congressional Budget Office, April 2009, retrieved February 1, 2012 . ^ "Obama plans to order full review of NASA's Ares I, Orion plans". Orlando Sentinel. May 6, 2009. ^ Harwood, William (October 20, 2009). "Ares I-X rocket hauled to launch pad for critical test flight | The Space Shot - CNET News". News.cnet.com. Retrieved March 1, 2011. ^ "US Spaceflight Gap Wider Than Thought". Aviation Week. July 28, 2009. ^ "Russia May Raise Price of Soyuz Seats". universetoday.com, February 10, 2010. ^ "Scrapped NASA Rocket May be Resurrected for Commercial Launches". space.com. Retrieved February 8, 2011. ^ "Part 6 of the Exploration Systems Architecture Study Final Report" (PDF). NASA. January 10, 2006. Retrieved August 5, 2009. ^ "NASA To Evaluate Non-recoverable First Stage for Ares I Launch Vehicle". Spaceref.com. December 4, 2006. ^ "Constellation Program: America's Fleet of Next-Generation Launch Vehicles, The Ares l Crew Launch Vehicle" (PDF). NASA. November 2008. Retrieved January 10, 2009. ^ "NASA Awards Upper Stage Engine Contract for Ares Rockets". NASA. July 16, 2007. ^ "Ares I Upper Stage change – receives additional capacity". NASAspaceflight.com. Retrieved August 7, 2009. Wikimedia Commons has media related to Project Constellation.